The Linksys WRV54G 35499visit from 2008.12.01. Finally we started the OpenIXP project! The Linksys WRT54GS was a really good choice, but there are some problems with it, mainly that the speed of the processor not enough for driving the radio/ethernet at full speed and unfortunatelly the radio and the ethernet driver not in GPL, so no any modification possibility,etc. After the first (semi)successfull compilation we have a kernel image, but how can we use it? First of all it is necessary to build the serial interface to reach the bootloader console. The original bootloader can load images from the tftp server and start it automatically ( it seems that the bootloader have just one eth port, the internet - address 192.168.2.1). Disassembling the original code shows that the kernel image loaded and executed with the small piece of code before and after the kernel code, so we do the same. After downloading - happened nothing, no serial console. Searching for the problem ( we are at the assembly code now ) and voila: the printascii doesn't work because it has hard coded address for the serial0 and we must use the serial1. From now we can debugging, but the normal console doesn't work. Tracking the code until the kernel real start show that the code is working.Patching printk to use the assembly code output routine help to mimic the console and find the real error: changing the serial port parameters (baudrate,etc) kill the serial port. But because this is just a console instead of find the error, we just skip the port setting and everything is working - at least the kernel started. Now the system starting, find the root filesystem, mounting it. The ethernet port1 (ixp1) after finding the right settings (mainly from the coyote board) and the right microcode image the internet ethernet port working. The original Prism54 card supported by the 2.6.13 kernel except the microcode - after find it we doesn't use the complicated hotpug firmware method,instead simly pass the microcode to the kernel driver. In the second minipci slot we use an Atheros 5213 a/b/g card. Because the new features the driverset downloaded from the new madwifi-ng, after some patching it is also working. The only thing remain was the first ethernet port (ixp0). This is connected to the Kendin 8995M switch controller - but with an SPI bus, so using the GPIO lines must implement the protocoll. In the implemented SPI driver the bus is reacheable over the /proc for userspace programs. After programmining the switch controller the LAN ports on the switch are reacheable, but the goal was an independent usage of the ports - therefore we must use the switch VLAN functionality. One side is OK, with vconfig is possible to create on the ixp0 interface as many VLANs as we need, but no the switch documentation nor the application notes content not working as expected - the switch can assign VLANS to the ports and working accordingly, but in this case on port 5, the port connected to the micropocessor there are no any traffic?.... The solution is to set the "special tag" mode on - in this case the switch in the VLAN header insert the port number also ( 0x810p instead of 0x8100). That way the ixp0 receive the packets but with "wrong" VLAN header, so as a quick and dirty solution in OSAL we simply masked out this byte... Making a /proc/sys/diag interface to driving the LED's after that was an easy task. Now we have the latest 2.6.13 kernel based linux on a writeable jffs2 filesystem on a powerful machine. The netperf result for the ixp1 94 Mbps on a switched ethernet network, ixp0 (with vlan) 86.5 Mbps , the atheros card (no turbo, gmode) 24.5-25 Mbps and the average processor load in this case 15-20%! Uncompressing Linux......................................... done, booting the kernel. Creating 3 MTD partitions on "IXP4XX-Flash. 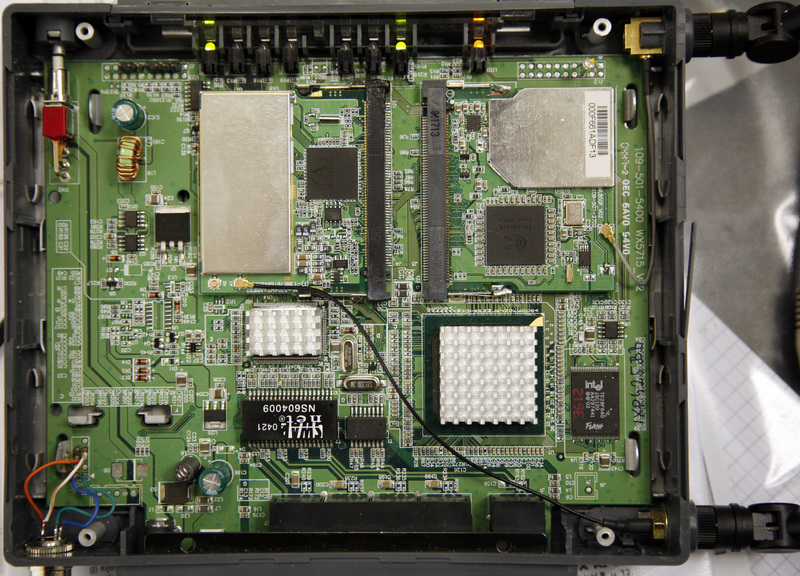 ixp400: module license 'IPL' taints kernel.